The Horror Movie BBQ: Niagara Falls Comic Con Coming Your Way! Yup. I'll be heading over the Rainbow Bridge(the bridge connecting NY and Canada) to meet some of my favorite entertainment guests and comic artists and writers. 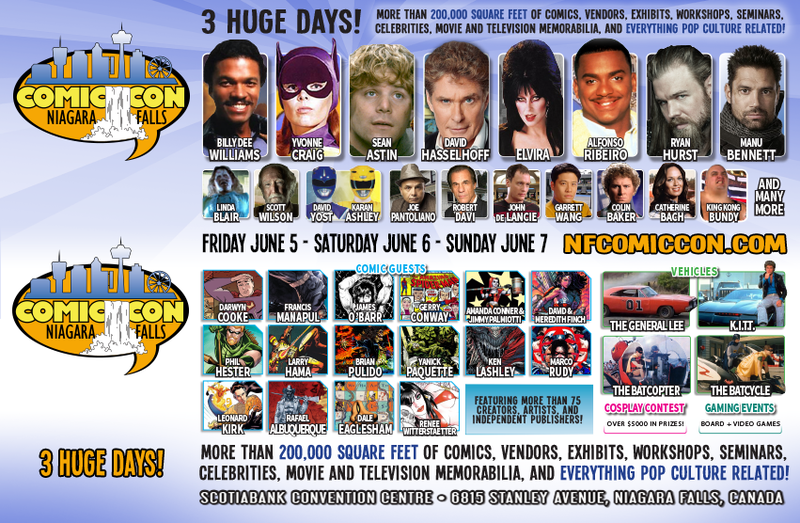 David Hasselhoff, Elvira, Scott Wilsom, Tom Savini, a Goonies Reunion featuring Sean Astin, Robert Davi and Joe Pantoliano, Ryan Hurst, and comic artists Amanda Conner and Jimmy Palmiotti are just some of the names you can expect to meet on June 5-7 in Niagara Falls, Canada. Ok, I know what you're saying, "Chad, it sounds like you're just shilling this show". Well, guess what, I am. Why? Because I really want to see the little guy get a big chance. Nothing wrong with a show like Wizard World or San Diego Comic Con, but the little, local shows are the shows that need are biggest support otherwise, we'll have a hard time getting more shows last longer than 2 shows. And good for us up here in the north, NFCC has been around for a few years now and looks like it could be a contender on level with the shows I mentioned previously. I get the sense the future is bright for this show! 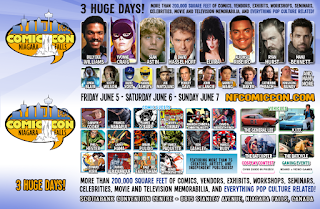 Note: Sadly, Yvonne Craig cancelled. I for one, cannot WAIT for this. I've always wanted to meet Elvira, The Hoff and Gerry Conway, the co-creator of one of my favorite comic characters ever, The Punisher. There's a LOT to do at this show, whether it's photos with your favorite stars, the great cosplay characters, the enormous vendors room, the Q&A panels, whatever it may be, this show has something for everyone. And lets be fair, you can't say that about every show. So, good for us! Bring Grandma Mary, bring little Billy, bring Uncle Rico! They're all gonna have a great time! You can find more about Niagara Falls Comic Con at their website where you can find autograph and photo prices, schedule and floor plans. Tickets are on sale online until June 2, so get them now! In my next blog entry, I'll be counting my favorite stars attending the show. Until then, have fun planning your trip!